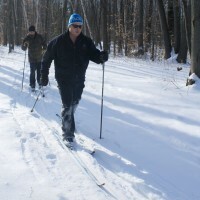 Terra Cotta Conservation Area offers cross-country skiing lessons! Starting in January, learn proper skiing technique from a CANSI certified instructor. Lessons are suited for beginners or skiers looking to improve their technique. Learn the skills to continue skiing and enjoy an active lifestyle throughout the winter months. Private lessons are avaiable weekends and holidays at five time slots throughout February for children and adults. Participants will learn the basics of cross-country skiing, followed by hot chocolate at the Visitors Welcome Centre. Weekday lessons are available by appointment Wednesday to Friday by emailing evan.orme@cvc.ca.